Our all natural hair conditioning pomade will help to tame your frizzies, soften you coils and give you some sheen. It will help to smooth and slick down unruly edges, tame frizzy coils and provide healthy sheen. 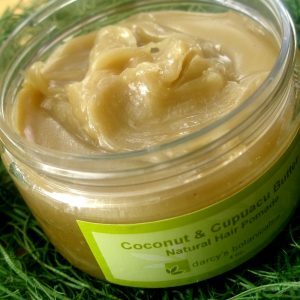 Cupuacu Butter is a natural emollient and is also highly moisturizing for hair & skin. It is loaded with essential fatty acids, vitamins, minerals and amino acids which make it very nourishing for hair & skin. Ucuuba fruit butter is also added for it’s highly moisturizing & emollient properties for dry, fragile curls. It is a very rich, earthy butter with that aids in controlling frizz. Our new line of pomades are thick & richly concentrated blends of natural oils. So a little goes a long way. Ingredients: Castor Oil, Organic Virgin Coconut Oil, Cupuacu Butter, Organic Shea Butter, Ucuuba Fruit Butter, Beeswax, and Fragrance.